In mid-December, Joker’s omeprazole came off back order and we started his daily dose. I decided to give him a week off then see where we stood. Unfortunately, I haven’t seen a change. It’s been almost a month. If he can’t see other horses, he loses his 22-year old marbles. 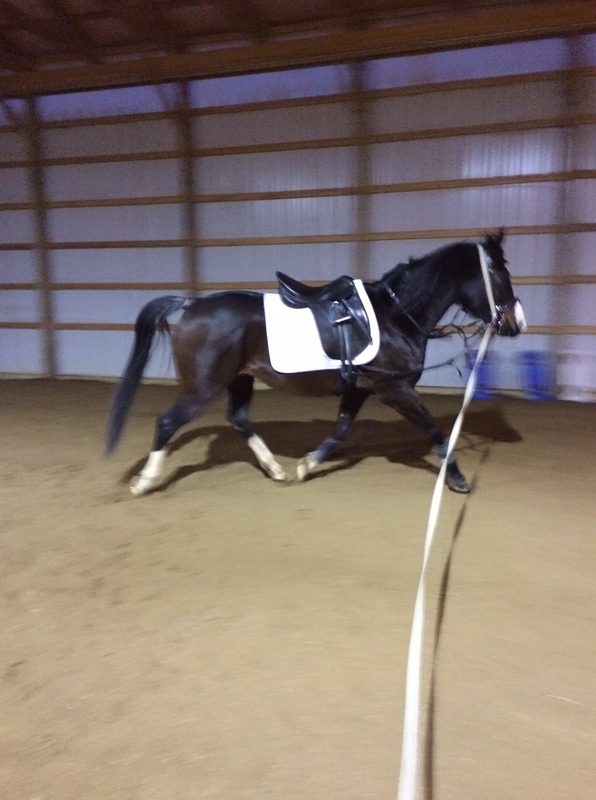 After we work for 15 minutes or so in the arena, he seems to do alright…usually. If there are other horses around, he’s fine. I have never seen a horse his age demonstrate new behavior like this. Hence my suspicion of ulcers. But no results so far. It is what it is and I’ll continue to do my best to do right by little Joker Joe until he goes back to Elise in mid-March. I’ve sort of accepted that he’s bad in the cross ties and is going to take a solid 15 minutes work under saddle to through.. whatever it is he’s got going on in there. During our last ride this past Thursday, there was a (drool worthy) young Oldenburg gelding who was being lightly lunged with a saddle for the first time. 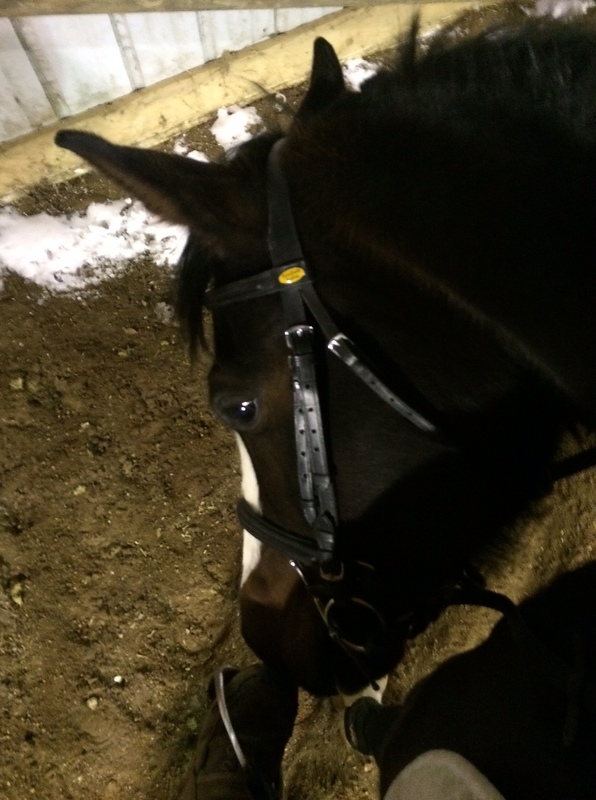 Joker didn’t flinch when the other horse bootscooted yet can’t seem to handle being alone…. horses, I tell you! I talked to the young lady working the Oldenburg and we agreed that she’d take half of our weeny indoor and I’d take the other. We essentially had a 20 meter circle to work with given the space constraints. 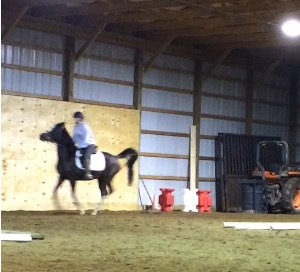 So I dropped my stirrups and really worked on opening my hips and keeping my hands up. In the few passes by the lounge window (that I use as a mirror #gottadowhatyougottado), I felt really good about my posture and ear-hip-heel alignment. Success! I’m no FEI rider but I’m proud of the progress I’ve made since early November of being back in the saddle after years away. Leg yielding down the long side is asking for sass with Joker so I decided maybe it wasn’t the best idea to push it in even a smaller space. Joker isn’t really used to using his body like dressage asks for so I try to be very patient, especially in light of his age. For fun, I thought I’d ask for a little shoulder fore and see what we had. And shoulder fore we had! I was completely pleasantly surprised. In both directions, it clearly made sense to him. Hmmm, wait, but leg yields are hard…. Light bulb. Exacerbated when it’s cold out, Joker is stiff, especially behind. Leg yielding is tough for him but shoulder fore is not. Is there a pattern? Perhaps. I have a hunch that Joker Joe is out in his SI, sacrum or both. Luckily, Elise is an amazing owner and immediately said let’s get the chiro out. So, when the weather allows, I will schedule him. Did I mention the weather is throwing off my groove? But really, not only am I not used to this real winter thing (I’ve lived in either Kentucky or Nashville all my life)… I’m pretty sure it’s not advisable to drive half an hour away from civilization to ride a 20+ year old horse when it’s not even 20 degrees. Or not even 10 degrees. This was this morning at the gym. Check out the Feels Like. That shouldn’t be legal. But it apparently is. Lame. And it comes with snow. We got about 6 inches in the past 24 hours and it’s supposed to continue snowing for another 6 or so. Excuse me while I grumble and hide inside with my cat and fifty blankets and beverage of choice. I apparently fell off the face of the planet in February and March because I didn’t blog at all those months. Whoops! 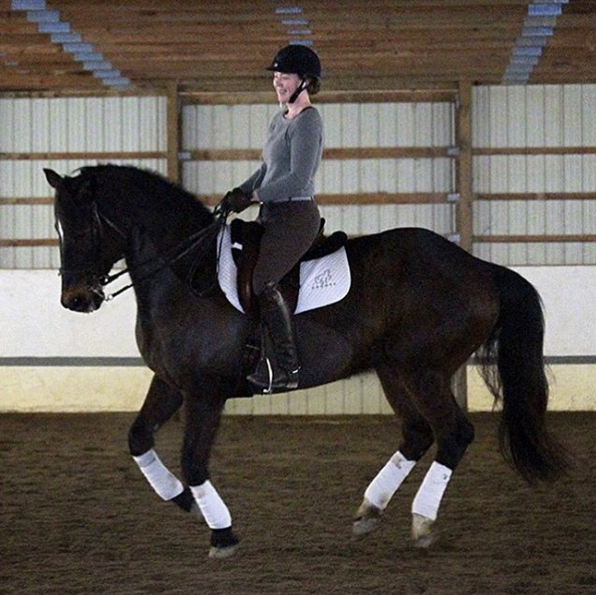 At the very end of April, Nibbles left Kentucky for Michigan and training with Elise! The end of April were Elise’s first rides on Nibbles where there was a lot of ground work and mostly walking under saddle. I must learn to be a good horse!? My mom, sister and I visit Nibbles in Michigan for the first time! 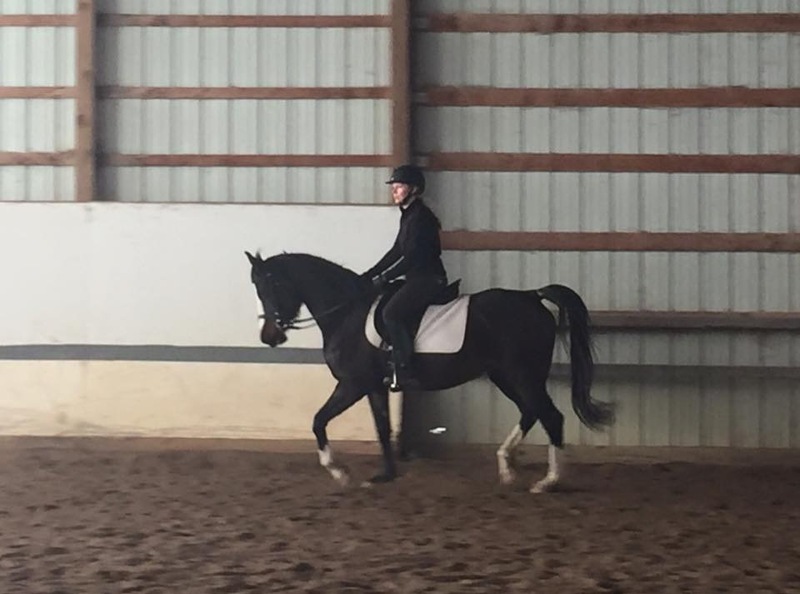 I see her canter under saddle for the first time. I got married and honeymooned in Germany, Austria and Hungary! Husband and I adopt Tucker! Nibbles goes to her first show and all involved survive! I fall off the blogging train again besides that. In hindsight, 2015 was a fairly hectic year for me personally. I left one job, started another. I moved to a new state. I sold a horse. I sold my trailer. I sent another out for training which is something I’ve never done in almost 20 years of owning horses. I got married. I honeymooned in Europe. I became a stepmom. Thanks for sharing the ride with me and Nibbles! Here’s to a new year! Finally, my Christmas recap post! Better late than never, right? My husband and I decided to have a quiet Christmas this year after hosting Thanksgiving at our place. We really, really enjoyed it and were basically bums all day. His big gift this year was an Xbox One. My family went all out and spoiled me this year with so much from my horsey wishlist. It honestly deserves its own post – so here it is! My aunt very sweetly printed and framed an older photo of Nibbles – the one from her About Nibbles page. The flowers were from my husband just because. And the rest of it were my horse-related Christmas gifts this year. Cue massive squeeing! My first surprise came by way of my sister who bought me a set of Leistner brushes. I had some of them many moons ago but they got stolen at a barn we ended up having to leave in a hurry. I’ve wanted new ones because they’re the best thing ever but honestly didn’t think it was worth spending that much money on brushes when I wasn’t riding regularly. This fall/winter, I have decidedly started riding again and I put them on my Christmas list thinking a girl could dream. My sister is the best! When my sister asked me what I wanted for Christmas, I told her the brush set or a nice leather halter for Nibbles. Obviously, the halter was more expensive (by a lot) and I really didn’t think either of these things would be realistic (we had already talked about little things to get for one another a while back). The brushes came in the mail first which was a huge surprise so I never imagined she would get me both. Have I mentioned my sister is the best? She went in with my parents and got me my dream halter for Nibbles. I’ve always wanted a really nice, padded 3/4″ leather halter with a nameplate. I mean, what girl doesn’t want one for their shiny pony? I may have freaked out a little…okay, a lot, when it came in the mail. The next one I kind of knew I was getting because it’s all I asked for from my husband and my parents. I’ve been riding in an older (9+ years) helmet and I’ve never owned one that cost more than like $50. I’ve been coveting a One K and told myself that I’d save up and get one when I got back in the saddle (and not just for sporadic lessons). I accomplished that this year with the help of Elise and Joker. I absolutely love my new One K Defender. It fits like a glove and I love how it looks. I didn’t think I’d be into the matte look but I decided I should take a chance and that’s what I asked for. I’m so glad I did. I’ve been in a velvet helmet for 19 years. It’s time for that part of the hunter princess in me to die hahaha. The next gift was a pleasant surprise that I was a part of. When hubby and I went to see Nibbles a couple weeks ago, we stopped at a local tack shop that was closing and had everything super marked down. Nibbles snapped the browband on her Stubben this summer and I haven’t replaced it yet. I only have the one black bridle so when I saw one super discounted, I pounced. It’s a really inexpensive brand so it won’t last forever but it will serve as a great back up when she graduates to something fancy, hopefully next summer. Plus, I mean, new shiny bridle? Yes pwease. Inexpensive materials but it’s soft and the padding and stitching aren’t half bad really. The last gift was made for Miss Nibbles by Elise and I just LOVE it. Nibbles’ color is that deep merlot/maroon color which she knows. Nibbles is a Shagya Arabian and, like warmblood studbooks, they have their own brand. Elise did a stunning job of hand painting the Shagya Sun on this brush in our colors. I used it on Nibbles when she gave it to me and told her it would probably never leave my house again because it needs it’s own pedestal. Merry Christmas and Happy New Year to everyone! Coming soon, an update on Joker… is omeprazole helping? Also, what are my goals in 2016? Blogger is going to try to be a real blogger! This weekend turned into a bit of an adventure although not because of Nibbles. When we left on Friday, the weather was clear and cold. On the drive up, we got caught in a lake effect snowstorm. Within 15 minutes, we had minimal traction and highways were going 15 MPH. We decided to stop tempting fate and – 30 minutes from home – get a hotel for the night. The next morning, the roads had been plowed and salted so we headed back out. On the way to the barn, we stopped by a local tack shop that was closing and got a steal on an early Christmas present for Nibbles (but I’ll be doing a new post just to talk about Christmas this year so you’ll have to wait). From there, we headed to the barn to see my pony. Nibbles hadn’t been turned out in 24 hours so she was tense and up. *sigh* One day, mare, you will come out with brain firmly installed and floor all of us. 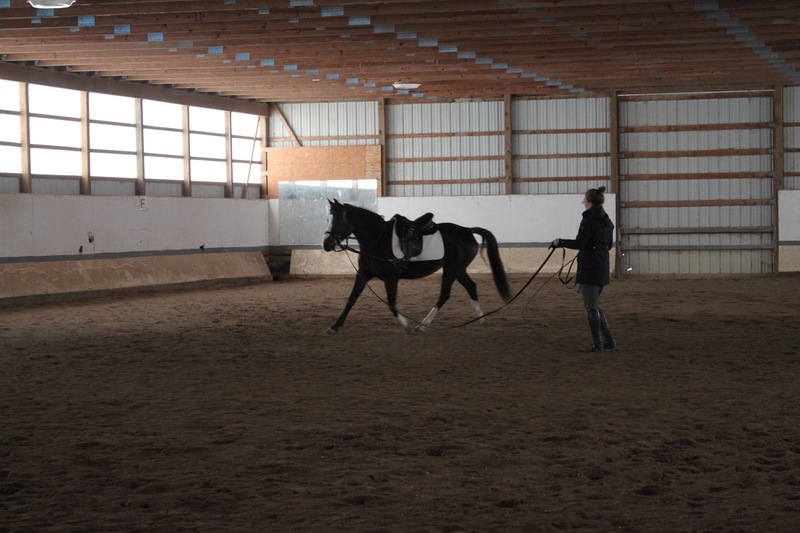 But until then, to the lunge! Elise popped on her first which was helpful for me to watch in person. She sure loves to canter now and wasn’t too keen to trot. One day all three gaits will be installed in equal measure but until then, I’ll take finally having a lovely canter. After Elise’s brief spin, it was my turn. I upped my stirrup a hole just in case. I didn’t need it. Guys, she was awesome. The trot was tense (shocker, Nibbles). Looking at the pictures, you can tell she’s tense but it doesn’t look near as wonky as it felt. She wanted to tip her nose to the left, too, which is interesting to me. Elise says that’s not uncommon for her. And then we cantered. Heaven on earth. Her canter was effortless. The cue was effortless. Riding it was effortless. It had the perfect amount of suspension. The best way I can describe it is that I felt like I was floating. Unlike her trot that day, it was more forward than up and calm and just dreamy. I didn’t want to stop. I stayed in a lighter seat just in case although wow, I’m farther forward than I thought in pictures. But at least my toes aren’t pointing straight out? One piece at a time for me and for her… After several trips in each direction, I hugged my pony and decided it was Christmas picture time.